Lenovo launched the Legion Y720 was launched in India in May 2017 and is exclusive to Flipkart product. 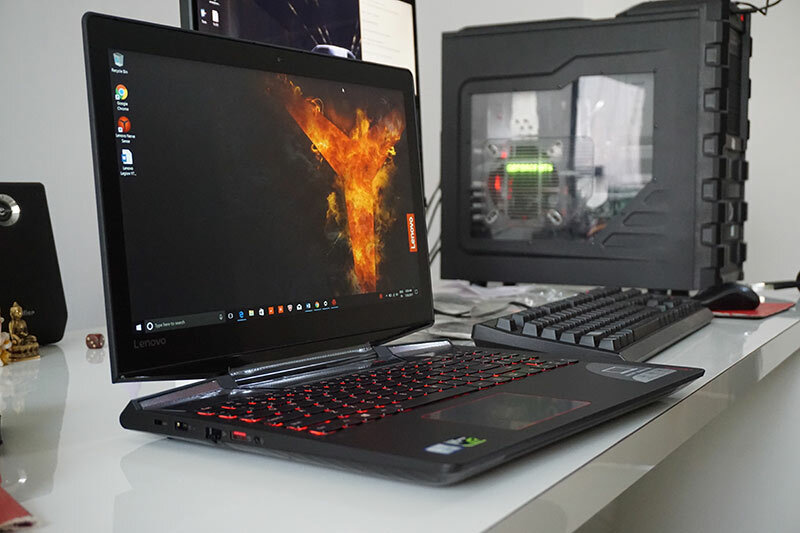 You may be able to buy it offline through the retail stores, but since it is a very premium gaming laptop, the availability may be limited to large Lenovo laptop dealers. Legion Y720 comes with an MRP of Rs. 158,900 and is currently available for purchase on Flipkart for a price of Rs. 152,300. 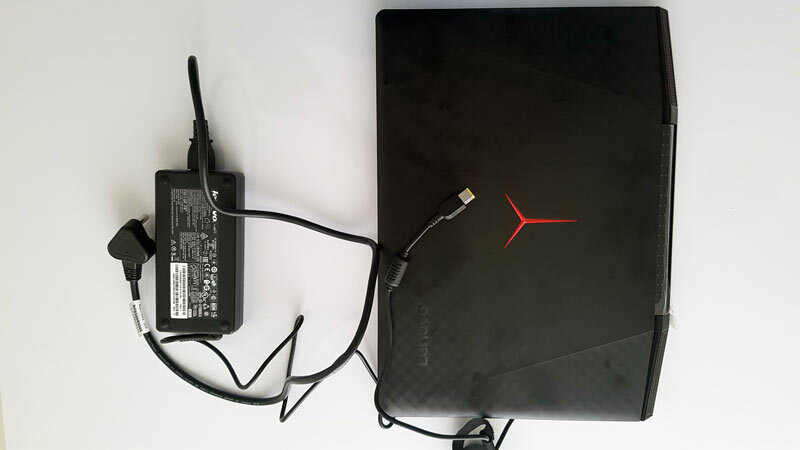 The laptop is available in the market along with the Lenovo Legion Y520 which comes at a cost of Rs. 92,490. 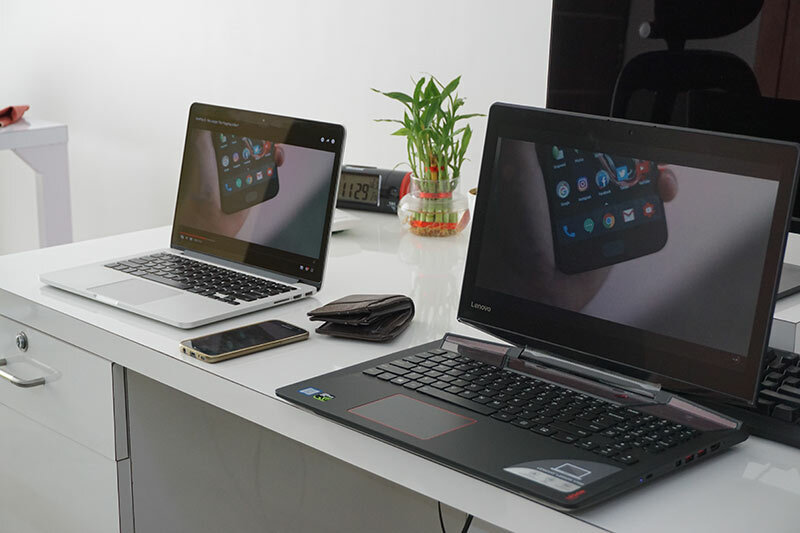 Both the laptops were initially showcased at CES 2017, in Las Vegas in Jan 2017. 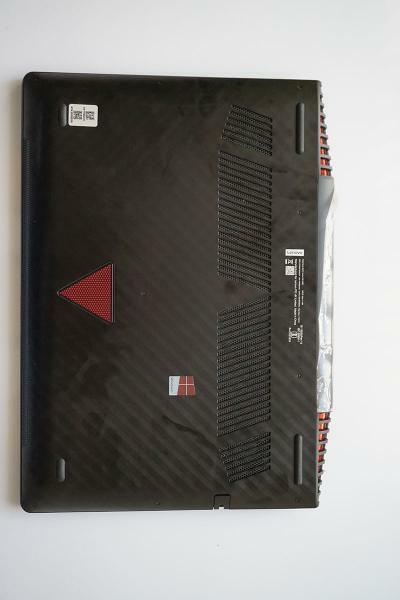 Legion is a new sub-brand from Lenovo which will have the next generation of gaming laptops from the company similar to Alienware from Dell or Predator from Acer. Powering the laptop is the Nvidia GTX 1060 and Intel Core i7 Quad Core processor makes it a real gaming notebook. Let’s see what we find inside the box. Let’s see what we find inside the box. As I received the box was glad to see the packaging was decent from outside to make sure there is no damage to internal contents during the transient. Something you need when you buy an expensive gaming laptop. The laptop comes foam packaging on all sides to make sure it stays safe. Moreover, there is a large charging brick which comes with the laptop. Also, there is a unique square charging port design that I haven’t seen before. The laptop charger is quite large and heavy and weighs half Kg. 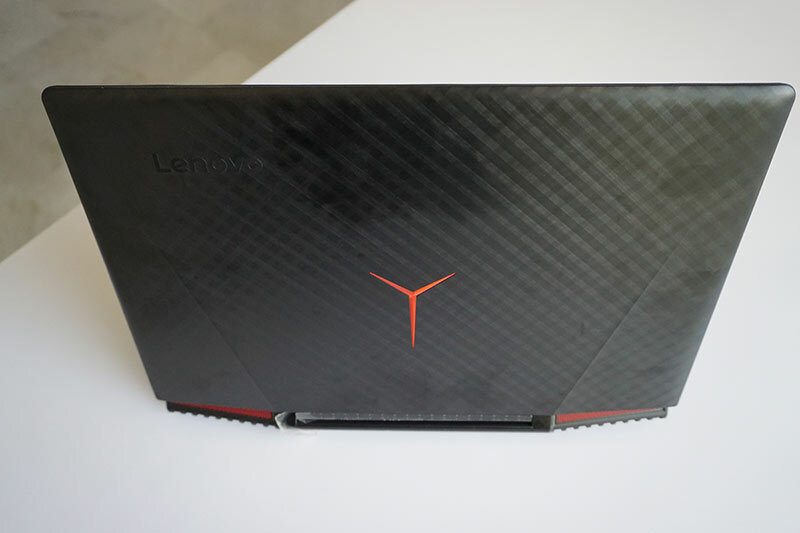 Then there is pretty amazing looking Lenovo Legion Y720, a dream laptop for any gamer. Lifting the laptop from a table with one hand is difficult. Moreover, I work on the Lenovo ultra light weigh Yoga 710 or on my Macbook. In fact, it weighs 3.08 Kg in comparison to 1.5 Kg weight for my Yoga 710. 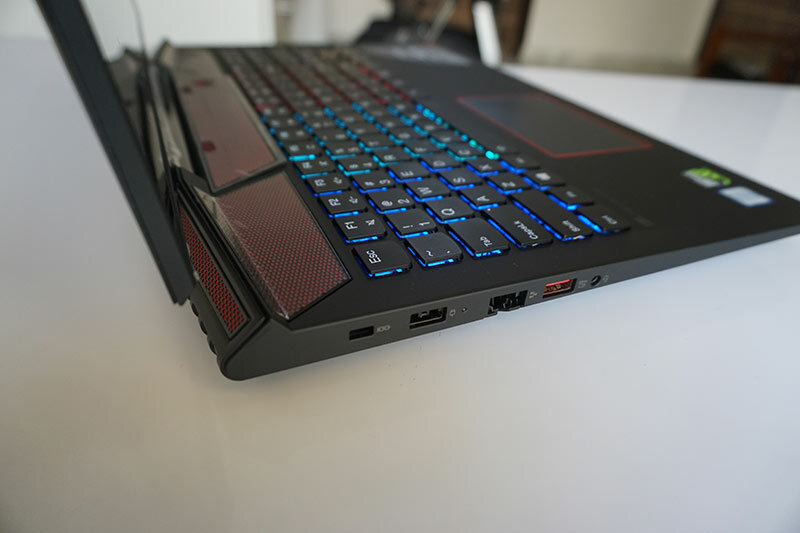 Let’s Proceed with the review and mind it this review is typed on the Lenovo Legion 720’s keyboard that I liked for typing. For starters, the laptop comes with a premium finish and build quality. 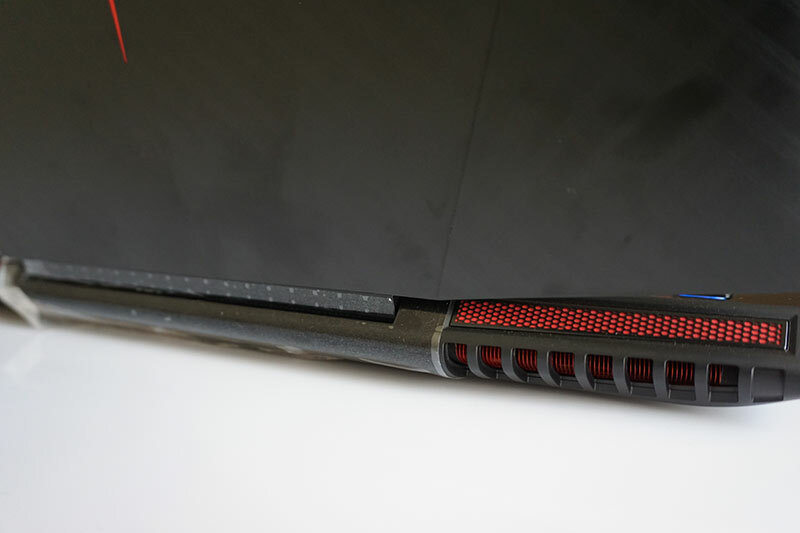 At the back of the gaming laptop, there is Lenovo Legion Logo which glows in red color as you turn on the machine. The back cover is made of aluminum metal with a textured pattern on it. 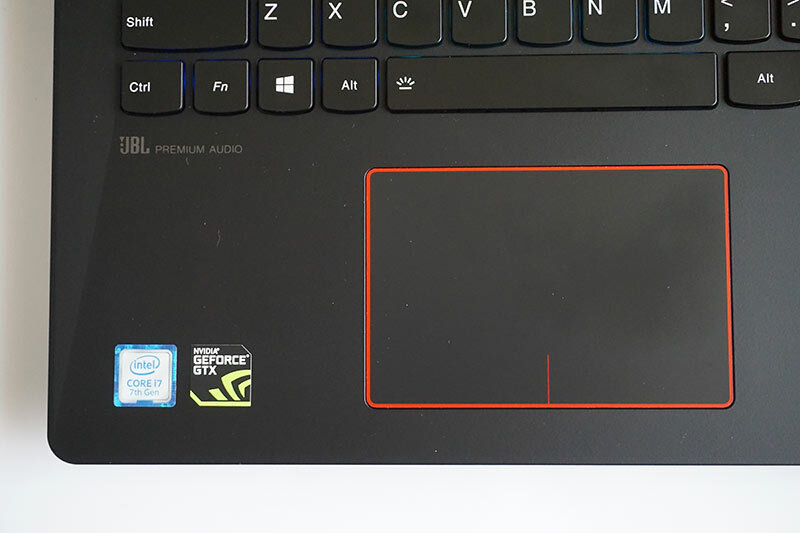 Also, there is Lenovo branding on one of the corners, at the back. The back side is a fingerprint magnet as you can see from the image below. It catches some fingerprint marks but can be cleaned up with a soft cloth. The color theme is black and Red throughout the machine which makes it look aggressive as well as very exquisite. The front side makes it look like an expensive gaming machine. The display has triangle shaped clearance at the bottom side making the looks more futuristic. Above the keyboard, there is large speaker grill that houses incredible JBL speakers hidden behind it. The power button rests in the middle of the speaker grill. Further, the keyboard keys and the trackpad offers decent touch experience. The surface surrounding the trackpad where your wrists rest, has a rubberized feel to it. A very natural typing and gameplay experience for your hands. At the bottom, it comes with a triangular speaker grill. Additionally, there are four rubber cushions to keep it firmly placed on your desk while gaming. Also, there are large airflow vents to ensure all the hot air goes out with ease. The display looks sharp and has acceptable brightness. It is not the brightest display in comparison to some other very high-end premium laptops, but for all indoor and gaming needs, it is sufficiently bright. Notably, the Lenovo Legion Y720 comes with a 15.6 Inch Display with Full HD resolution (1920*1080) pixels. The display panel is not very glossy and does not reflect too much of background lights. Also, the color reproduction looks okay and notably it is not a touchscreen laptop. Furthermore, the display comes with sRGB color space percentage of about 57%, and the maximum brightness is 275 nits. This is low as far as benchmark goes. Also, there is some anti-glare coating on display to make it more easily viewable. Viewing the monitor from sides fades the colors out a bit, and it is best to have a straight view of the monitor. Further, It comes with JBL speakers and boy oh boy it does sound better than most laptops I have tested and used in the past. The JBL speakers offer exceptional audio quality with sufficiently high volume. While most gamers including me prefer to plug in a headphone when playing games the decent speaker is an advantage if you are watching some movies or videos online. Also, Lenovo is using the DTS Dolby amplification along with dedicated software support to fine-tune the audio output when you are gaming, watching movies or listening to music. Even, the sound from headphones is superior in comparison to any other ordinary laptop. In nut-shell, it sounds good. I am giving full marks to its sound and audio. The Lenovo Legion Y720 comes with a very easy to use Touchpad. It measures 10.5*7.5 cm, not one of the largest but offers a very responsive touch and user experience. The red border around the trackpad makes it look pleasing. The touchpad has a very smooth feel to it. The left and right click buttons are also easy to press, without the need for applying much pressure but at the same time, they don’t get pressed accidentally. Also, the click sound is also nominal. 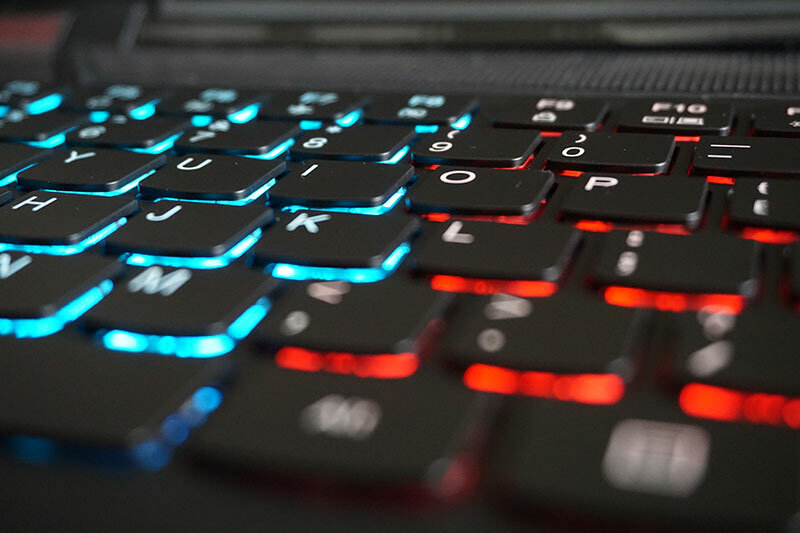 RGB Keyboard – This is what makes a good gaming laptop better. The keyboard comes with rubberized-touch backlit keys. You can change the color profile for the RGB backlighting by pressing space bar and the function key. Notably, the keys are rubbery soft to press and work on, I have been typing and playing games on this laptop, and the keyboard feels responsive and easy to use. I am a fan of Lenovo Thinkpad laptop keyboards, and even the Legion retains some of the exceptional characteristics. The key travel is adequate and keys don’t make much noise while typing. Additionally, the large arrow keys are a great plus point if you like to play racing games. Page Up and Page down keys are difficult to find on the keyboard and there is even a dedicated key which can record your gameplay. Overall the keyboard on the Legion Y720 is impressive, and you will like using it for everything.